Pot Stickers, also known as Gyoza, are Japanese dumplings that are fried before steaming, to acquire the signature brown bottom – hence the term Pot Sticker. I adore them, and they are not that hard to make! The recipe is fairly elastic in that you can prepare them to your own taste, or the ingredients on hand. The instructions are detailed, but it’s dead easy, I promise. 500g of mince. You can use pork, a combination of pork and prawn, or chicken.Today I used pork. 2 cups of finely chopped Wombok, or Chinese cabbage. A teaspoon each of fresh minced ginger and garlic, to your taste. Sometimes I leave out the garlic. Olive oil. Or be authentic and use peanut oil. Sesame oil, soy sauce, and chili sauce to serve. Combine mince, wombok, spring onion, ginger, garlic, and soy in a bowl. Let it rest for about 15 minutes to let the flavours combine. 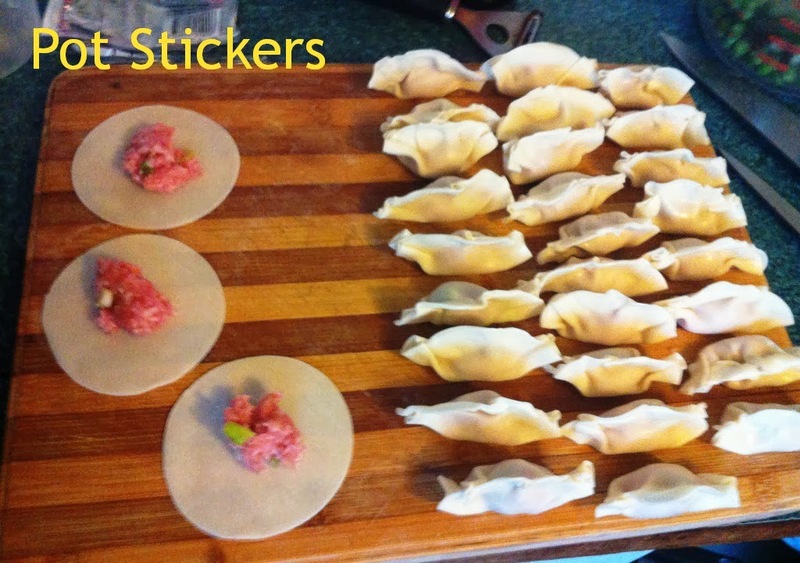 Arrange as many won ton wrappers as you can on a chopping board or flat clean surface. You can keep the unused ones under a damp tea towel if you like, but you will be working fairly quickly and using the whole pack, so they won’t get a chance to dry out. Put a scant teaspoon of the mince mixture in the center of each won ton wrapper. Resist the urge to overfill! Overfilled pot stickers don’t cook well, and tend to gently explode in the pan, making a mess of the rest of your work. Use your clean finger or a pastry brush (I use a 1 inch paint brush in the kitchen, which I think does a better job than those silicone brushes) paint water around the edges of the won ton wrapper. Pick up a pot sticker, and hold it in the palm of your hand. Pinch the far edges together at the top, then use your fingers to crimp around the edges until the filling is enclosed and there are no air bubbles. You will get the hang of it after a few, then zip through the rest like no ones business. When you have finished, pour a little oil in a large fry pan, that has a tight fitting lid. I like to use a non stick fry pan so that my pot stickers don’t actually stick, and the oil ensures the bottoms brown nicely. Heat the fry pan, and arrange the pot stickers frilly edge up. Don’t crowd them or they will stick together during the steaming stage! You might need to do 2 batches, which is fine, because they take no time to cook. Let them sizzle away for a few minutes, until the bottoms are browned and a little crispy, not too much. When they get to this stage, quickly pour half a cup of stock over them and put the lid on. After 2 or 3 minutes, check on them – the wrapping should be softly steamed and well cooked, the bottom still brown and crispyish, and the filling cooked through. Hopefully they won’t be stuck to your fry pan! Plate up on a big serving platter, drizzle with sesame oil, and pass some dark soy and chili sauce separately. If you are anything like me you will want to scatter more finely chopped spring onion over the top, to make it look pretty. NOTE: What do I do with the leftover mince you ask! You will have some left over that is fine to freeze for another day, or cook as small meatballs and toss through some noodles, or combine with cooked vermicelli and use as a spring roll filling. ← Bacon Soup. I mean CHICKEN! Chicken Soup! I LOVE a good gyoza too, but I think some of that love is having someone else cook them! I remember reading 'pot stickers' in a book as a kid and thought it was odd…I may have had a literal interpretation of them haha. Doesn't sound too much harder than rice paper rolls really. I think I'll have to give these a go! They only stick a little bit, promise! They are not hard at all, let me know how you go! A women after my own heart! I saw these on the link up and just had to pop over to see, I could go to sushi train and just eat plate after plate of these morsels of goodness, these and the chilli prawns…yum! Hubby and I went to Japan (Hokkaido) and had the best ones Ive ever tasted in a Ramen restaurant on the Niseko ski fields. I'm sure the setting help a lot! but I have yet to find anything that can surpass them! Kim they are so addictive, I'd send myself broke at the Sushi Train! I can imagine pot stickers in Japan would have to be the best pot stickers ever. Lucky You! I heart Japanese food so much, especially sushi. Yum! My first batch of pot stickers where not as good as going out, but you get better, I promise. Thanks for stopping by! After gorging mysel fon dumplings last weekend, I'm so adding this to my to do list!